In 1933, soon after the Harlingen Municipal Auditorium was built, the Rio Grande Valley Civic Music Association formed, to bring top-notch entertainment to the area. In the 1940s, the Association began working with a booking agency out of New York City. Groups like Civic Concert Services, Inc., helped music lovers around the nation work together in bringing reasonably-priced artistic attractions to their communities. By raising money first, through memberships, and having a secure tour route of suitable venues, artist fees were kept reasonable and seasonal memberships very affordable. 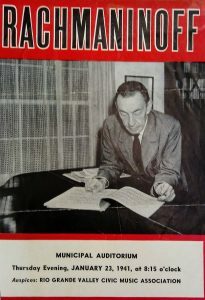 Between 1945 and 1950 the total number of community concert associations rose to an all-time high of 1,008. 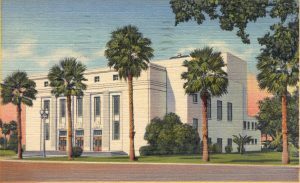 The roster of performers who have graced the stage of the Harlingen Municipal Auditorium over the decades reads like a who’s who of international and American stars. Paul Robeson, the Von Trapp Family Singers, Mitch Miller, the Tommy Dorsey Orchestra, and Guy Lombardo are among the more familiar names. 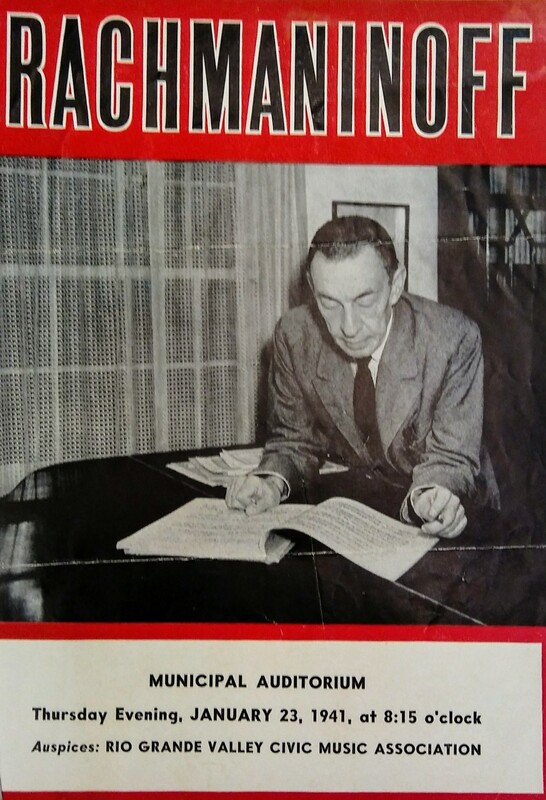 In January 1941, the famous pianist, composer, and conductor Sergei Rachmaninoff performed. 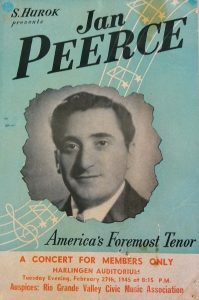 “America’s Foremost Tenor” boasts the program for Jan Peerce’s 1945 appearance. 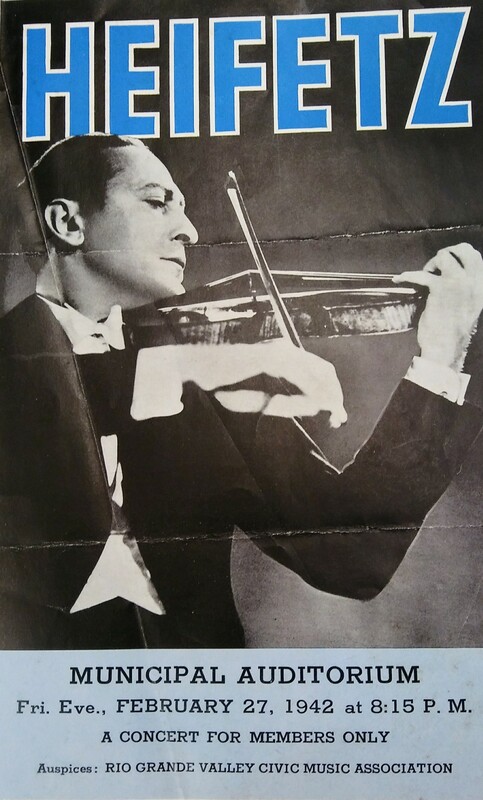 The yellowing playbill for violin virtuoso Heiftez waxes eloquent on his favorite instruments, a 1731 Stradivarius and a 1742 Guarnerius, which accompanied him on all of his concert tours. There have been ballet and dance troupes, big bands and orchestras, choral groups, vocalists, pianists, folksingers, brass, jazz, and string ensembles, banjo quartets, harpists, harmonica virtuosos, and much, much more. The Rio Grande Valley Civic Music Association was superseded by the Harlingen Community Concert Association in the 1960s and now is known as the Harlingen Concert Association. This all-volunteer, nonprofit organization remains committed to enriching the cultural life of the Harlingen area through live performances. Thanks to season ticket-holders, and a strong partnership with Live on Stage, based in Nashville, Tennessee, outstanding concerts continue to be offered at very affordable, family-friendly prices. The Harlingen Concert Association now offers five to six outstanding live performances each fall and winter. Artists range from pop and country to classical, jazz, Broadway, Irish, and a variety of international musical styles. We also sponsor performances by these world-class artists for area students and encourage them to attend our evening concerts. We are proud to be celebrating 86 years of success in bringing live entertainment to Harlingen and look forward to continuing this legacy for generations to come. Your generous tax deductible contribution will support the arts in Harlingen, allowing HCA to present outstanding performances and educational outreach programs at area schools. If you would like to become a season sponsor, please email us at harlingenconcertassociation@yahoo.com and we will send you a sponsorship packet. Thank you! Harlingen Concert Association is a 501 (c) (3) non-profit organization. All monies donated over the price of a season ticket are fully tax deductible.